Features: Corrosion resistant, Accurate dimensions, Can sustain high pressure & temperature load. Our organization is engaged in manufacturing of a wide range of Inconel 718 Blind flanges that is used to close ends of piping systems. Inconel Flanges are robust and their universal specification design ensures that these can be fit properly to any pipe or systems. 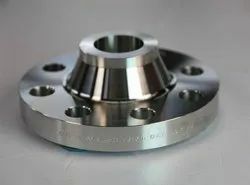 We Are Dealing in Inconel Flanges .We Are The Exporters , Stockist , Supplier, Manufacturer of all sizes of Inconel Flanges. - Widely used in furnace hardware, gas turbine engine ducting, etc. - Production standard: ANSI/ASME B16.5, ANSI B16.47... API, DIN, JIS, BS. - Production size: 1/2 inch - 48 inch (15mm - 1200mm).